Europe’s ancient pagan religions had their origins buried deep in a pervasive natural philosophy whose origins can be traced far into the pre-historic archaeological record to the cultures of the Bronze Age and Neolithic periods. This philosophy was one of death, the afterlife, regeneration and links with the ancestors. Not only does it employ the analogies of life-giving springs of water, regenerating serpents and the firmament of putrefaction from which life re-emerges, but also the active growth and re-growth of plants and trees in nature, particularly the nourishing agricultural crops and wild foliage sustaining man and the animals he relied upon. For this reason, the symbolism of the branch and the ear of corn was of particular importance to Europe’s ancient pagan cultures – Celtic, Thracian, Greek and Roman. 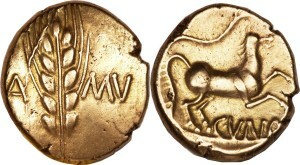 Corn ear on a coin of Cunobellinos (Catuvellauni/Trinovantes) 1stC AD. It is possible that Cunobellinos was an initiate of the Greek Eleusinian mysteries, perhaps part of the scheme of Caesar Augustus to ‘Romanise’ the wild pagan elites of north Europe. The branch is a particular symbol found on the ‘Anted Rig’ British celtic gold staters. Like those of Cunobellinos, they were minted during a time of crisis in the Celtic world, when tribal unity was of utmost importance. 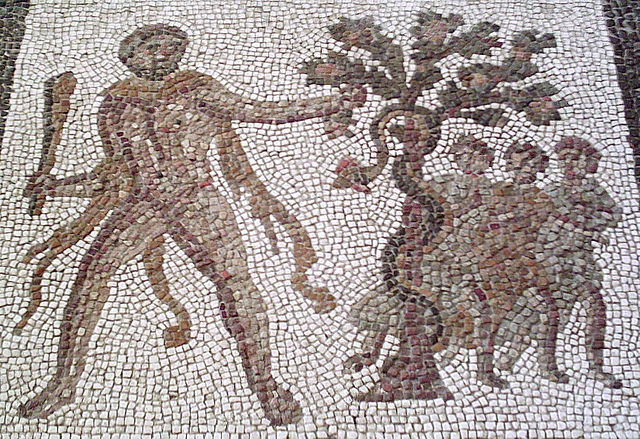 The analogy of the tree is of particular importance, and sacred groves were of great importance to all of Europe’s pagan religions – be they Celtic, Greek, Germanic, Thracian or Roman. Sacred trees remained important to the cosmologies of Europe’s longest-surviving pagan traditions (for instance, Ireland, Scandinavia and the Baltic states) far into the middle ages. They represented the ‘reflected’ symmetry between the mundane and spirit worlds. The roots below the earth are a reflection of the branches in the air above. The tree was therefore a link between the supra-terranean world and the mysterious chthonic realms into which living matter decayed and from which life seemed to eternally regenerate. ‘As above, so below’, so the saying goes. The idea of the ‘family tree’ depicts the analogy of ancestors and generations. The roots of the ‘family tree’ were the ancestors, the trunk the living patriarchs and matriarchs, and the branches and fruits the future life and continuity of the family. Trees are analogous with rivers in many ways. The tree’s branching nature shares a very distinct similarity with the patterns exerted upon our landscapes by rivers. The winding nature of great rivers is also analogous to the shape of the snake, and rivers, trees and snakes are distinct in the symbolism of the Otherworld and its flow of interaction with the ‘world of the living’. Trees and plants rely very strongly upon sources of water, and are also prone to being struck by that other great ‘branching’ phenomenon of nature: lightning. Nourished by water welling up from the earth, and destroyed by lighting branching down from the sky – it is no surprise that the tree is such a potent symbol of the forces connecting the heavens and the earth… Trees are the longest-lived organisms. Trees outlive almost any other species, and are therefore entrusted with the positive faculties of age: wisdom, perseverance and constancy. Trees might witness events spanning the lives of successive generations of humans. They protect and shelter, we build our homes and conveyances from them – they are a source of strength and protection to us. The physical nature of wood changes little after its death. Apart from ceasing to produce leaves and new growth, wood maintains its structural properties much better than other living organisms once it is dead. Well-treated wood lasts millennia, in fact. This property gives it a special place in human consciousness and imagination. The tree represents monarchy. The stout trunk and roots are the cohesive force of monarchy itself, with the topmost branch representing the king or queen and the lesser branches the subjects. I love how you’ve shown the ‘interconnectedness’ between all living things, and the underworld, earth and sky. A very well considered post. Just out of interest, re the panel of the Gunderstrup Cauldron you’ve shown there; in your opinion, does this show a scene of human sacrifice, or one of ‘baptism’? Celtic cultures of the 4th-1stC BCE had a very interesting attitude to death and human-sacrifice, according to the accounts we have from contemporary writers and the archaeological record, so your question is very relevant. 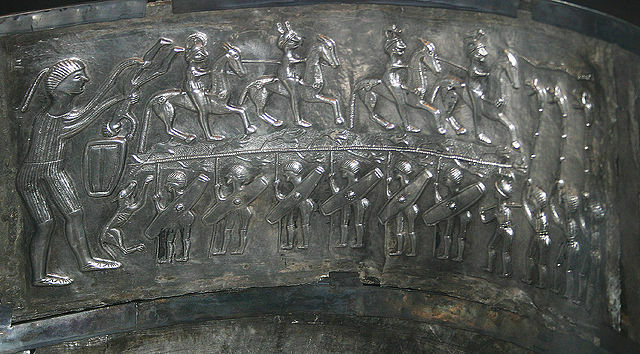 The scene on this panel of the Gundestrup cauldron shows a troop of mail-clad foot-soldiers proceeding left towards a giant mail-clad warrior accompanied by a dog. As he appears to be dunking one of them in his bucket or cauldron, it seems to me to be a scene depicting a god transforming humble soldiers into knights – the horsemen proceeding from left to right above the ‘tree’ which divides the upper and lower registers of the image. The Celtic fighting elites were the knights, who had won their position in battle, and this tradition continued into Europe’s middle ages. The craftsmanship is Thracian, and the cauldron was probably created during the time of the ‘Belgic’ cult during Celtic expansion following the 3rdC BCE… . I may be wrong here, but I thought that corn was originally only native to the America’s. To me the picture on the coin looks more like wheat. Sure – ‘corn’ is also used in Europe-English to denote any grain crop too. 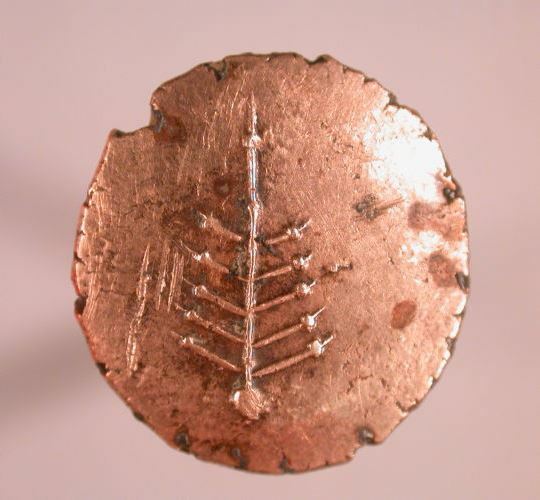 The coin shows a head of barley, also called ‘barleycorn’. Sorry for confusing!